The why is unclear, but for some reason aliens have decided they need cows on their home planet. 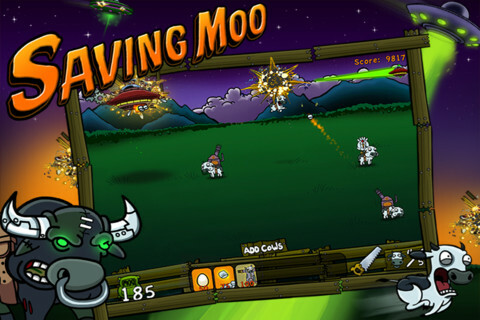 The result is an all out pasture battle by Chillingo called Saving Moo, and it’s wonderfully addictive. The game starts with a couple of cows grazing on grass. The skies are filled with brilliant blue and all seems well on old McDonald’s farm. Then suddenly a radar pops on the screen and the cows (and their respective players) must brace themselves for an all out war to stay earthbound. 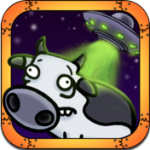 The only way to avoid impending abduction is to arm the cows with weapons on their back and disintegrate the spacecrafts out of existence. Doing this isn’t as easy as point and shoot though, and Saving Moo takes quite a bit of strategy to master. First, weapons must be paid for with the collection of green bags. 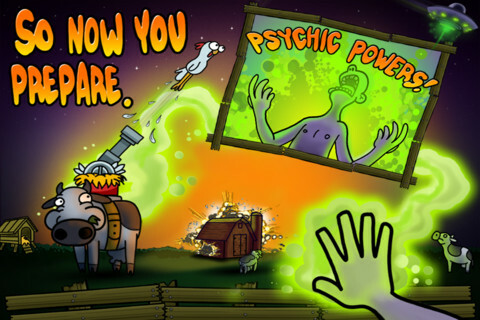 Each grazing cow produces a green bag every few seconds, which players can pick up by touching. When green bags are collected they automatically add money to the bank. That money can then be used to purchase weapons, cows, and eventually even better weapons and stronger animals that graze. 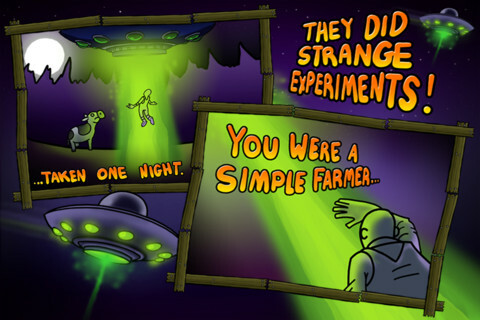 The first couple levels are all about getting the hang of the process, but once you’ve saved a few cows the UFOs start to arrive in greater volume. At the same time, players are given a stronger arsenal, from burning marshmallows that stick to the side of spaceships and burn them into nonexistence, to corn flingers and cannon balls. 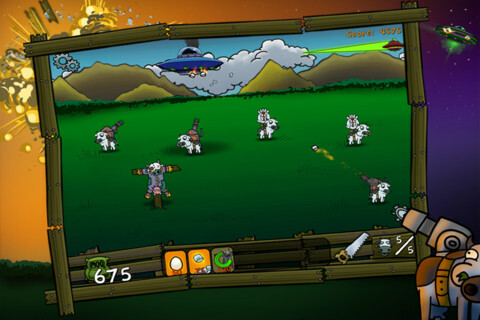 Each weapon costs a different amount of money, meaning sometimes players must make do with their current fleet before saving up enough to buy a new cow and weapon. The challenge is taken into yet another arena as color coded weapons can only be placed on specific cows that can handle them, and each level restricts the number of cows you can have on the pasture at any given time. The result is a wildly fun combination of strategy and action. 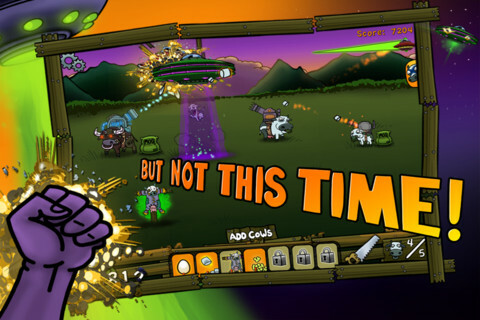 If I hadn’t already been addicted to Plants vs. Zombies I’d think this game was the king of cartoonish games where the object is to fend off opponents, but Saving Moo also works well as a complimentary title. Bottom Line: Saving Moo is a multi-level pastoral battle all about keeping our cows on the ground before the aliens take off with our dairy supply. Brace yourself, this game is addictive.